Well, you decide, but for me it has some flaws. The artist is Andy Hazell - sorry - Andy Hazell - and though that second link tries to explain the piece (all valleys and rail, coal, canals and chainworks) we at St Catherine's have found the simpler and more obvious explanation. It's a presentation of the Gospel. The boat in the middle is life, with people sailing through seeking a way forwards. The bridge on one side is a representation of the Old Ponty Bridge, but also the way that God reaches down to us, and in Jesus bridges the gap between heaven and earth to draw us home to himself. The wheel on the other is none other than a reference to our own logo, inviting people to join the worshipping family of Jesus as the best way of making life's journey across the seas of life. So good of RCT to commission a sculpture featuring our logo at the gateway to town. Art is glorious. This is dull. That's the bottom line for me. Please disagree and tell me why I'm wrong. In July, I wrote of walking through the mountains in Wengen with Maggie Gerber and seeing a way forwards for the homegroups here at St Catherine's. It's interesting that today I should receive the pack from ICS about my next chaplaincy in Wengen at New Year. For today our new series of homegroups began, springing from that walk with Maggie in July. We now have three groups. Two are standard groups: a meal, a bible study, prayer; one is a lunchtime affair (the one that produces PodCaths), one an evening group. The third group has no meal, just coffee and cake, and starts a little later, and meets only fortnightly. And its focus, whilst including some Bible study, is slightly different: for it is a singing group. Not a choir. We aren't going to robe or sit at the front of church every week. But we will sing, songs and hymns and anthems, and we will learn music together and the art of reading and performing and worshipping together. And from time to time we will sing a piece in church, or be able to take a lead, or lead worship in some way. Tonight was our first gathering. Rich, rich harmonies in worship songs, and we learned SS Wesley's "Lead Me Lord" - an anthem we use as a worship song, but tonight we went back to the original version. It's simple and beautiful, and I think this group is going to be great - at singing, at worshipping, at opening the Scriptures - and, in time, at praying together and for each other. Wonderful people, amazing to see something new begin. "Sometimes you have a noisy neighbour. You cannot do anything about that. They will always be noisy. You just have to get on with your life, put your television on and turn it up a bit louder." Thus spake Sir Alex, after Manchester United's 4-3 victory over Manchester City this afternoon. It was a great match - marred by silly mistakes, the final one of which came in the final minute of regulation time when United gifted City an equaliser to make it 3-3. We had a great day at church today. I love being here. I love worshipping with these people. I love being part of our generous Jesus' family. With all the challenges and wonders that come as part of the package. Glorious. The Times gave WNO's new production of Traviata a four star review; I don't agree with much of what they say. But on the whole, it's a fair score. It's an uneven evening, I'm afraid. Dario Solari's Germont was, for me, from the "wooden plank" school of acting, and as lovely as his singing was, this meant I kept losing emotional contact with everything. Alfie Boe was often excellent as Alfredo, sometimes as passionate as he needed to be, a little English sounding, then very Italianate - and I kept thinking about other tenors I've heard here. When he was good, he was very good; when he wasn't, he was OK. But I cannot tell you how many Traviatas I have seen over the years. Verona's great production where the eponymous heroine leaves in a horse drawn carriage at the end of the first act (she cracks the reins as she hits the final note & off stage she goes) certainly leaves a lasting memory. It was also my first. Angela Gheorghiu's opening night at Covent Garden in the role will never fade - she was spectacular. But the only performance I have ever so far seen that comes close to that or even (maybe - just maybe) surpassed it was at the Millennium Centre tonight. Myrtò Papatanasiu is a perfect Verdi soprano - steely but vulnerable, with a gleaming high Eb and effortless runs. She looked perfect and acted the role with conviction and stirring intensity. She was Violetta. What does this crowd want? They sat they and applauded at the end like it was something they expected to be treated to every day. I'm sorry, they will not see a Violetta like that again for many, many years. I stood and cheered for her curtain call, and shame on Cardiff that as far as I could see I was the only one on my feet. I don't easily stand for an ovation; far from it; but this girl is remarkable, and I am thrilled to have been able to hear and see her tonight. If you get the chance - buy/beg/steal a ticket. It's an uneven evening. But Myrto is a sensation. And the sun came out to wish me farewell. We ate breakfast on the terrace. I wandered around the hotel and took a couple of departing photos. Till next time. When I hope the euro rate is kinder, and I can finally enjoy a whole week in paradise. I thought some more about those friends of mine I mentioned yesterday, and one or two others I met in church on Sunday morning. People I knew from a million years ago who greeted me with lines like - "Here's my baby son; he's a twin - no, the other died; I'm expecting twins again now". Or, "my mother is dying". Or, "my wife can't make it today, too much pain". When we were young, the world was before us, with nothing but possibility and horizons that were blue and endless. Paradise was not a week's holiday, it was our rightful life. Christ stands in the midst of our lives, incarnate, human, battered, bloody, and gloriously resurrectedly whole to declare the damage is not the whole truth. In that day they will say, "Surely this is our God; we trusted in him, and he saved us. This is the Lord, we trusted in him; let us rejoice and be glad in his salvation". Yes, sunshine. It doesn't deny the rain. It feels great after the rain. Both sun and rain exist, and both make us who we are as we choose how to live in them. But I choose to live for the day when the tears will be wiped away. I choose to live in hope of the new day. I choose to live in the Son. OK. It rained today. Pretty much all day. I moved from room to room, chatting to friends (mostly in the States) via the internet, reading the latest Margeret Atwood, listening to Count Basie & Verdi. And then it was supper. A fish main course - something untranslateable from the Lake. Fantastic. And for dessert, a pear and chocolate concoction involving the most perfect filo pastry. But I mentioned how much I had loved the Walnut terrine from 2 nights ago, so they included more of that too. And most of a bottle of local white. And a glorious cappuchino afterwards, with Champions league on the TV. Am I in heaven? Three and a half days of glory; even without much sun. You know, I've had some friends on my mind while I've been here. People facing marriage problems, a couple I knew at college whose marriage has ended, a couple who are very much still together but whose kids are often ill - I had a dream about some of these. I have my own problems. My own troubles. Life has its kicks. And its blessings. We have to count the blessings when we feel the kicks. And the blessings are felt in each other. And in the desserts in this hotel. Even in the rain. At last week’s clergy school, we spent the whole time on the subject of “Anglican Identity”. I’m not sure we came up with any earth shattering new ideas. It was a positive experience – and that was a good thing – for I do believe it is a positive thing to be an Anglican, and sometimes we can be so wrapped up in the problems of the Anglican Communion that we lose sight of that. But afterwards I sent Christopher Smith, the Archdeacon of Morgannwg, an email. In it, I reflected on a conversation we’d had one breakfast, and encouraged him to buy the Verdi Requiem reviewed here a couple of posts ago, and invited him to come along to my next gig singing with the Byron Jones Big Band on October 7th. I then wrote something like, “I wonder what this email says about Anglican identity?” as I mused about the incongruity of those two musical forms sitting side by side in my life! 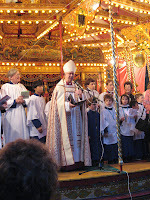 Christopher wrote back: “I think it says that Anglican Identity is much more meaningful when set to music”. You know, we did nothing on this at our clergy school, but I think Christopher has actually touched on something which is key in Anglicanism. We are a musical church. A singing church. We are not just a listening church, but a participating and involved church through our music. Anglican hymnody may be parodied, but it is the model on which all other hymnody is based; Roman hymnody is a pale reflection, and non-Conformist (English language) hymnody is (without the Wesleys, who were still Anglican when writing) a development. Modern worship music finds some of its key expression through Anglicanism – Matt Redman, Tim Hughes and even Graham Kendrick all began within the Church of England. How did we do a whole clergy school and not consider this? We did of course worship. Very Anglicanly. With music. Including some bizarre hymns, which I wouldn’t encourage. And some lovely touches which I would. But we didn't consider what we actually did. So: "the Anglican Church is a Church best set to music. Discuss." How about that for a thesis, anyone? Surely in Italy I can be guaranteed some sunshine? You’d think? It was raining when I touched down in Verona. I kind of felt it was going to. I mean, after this summer, it was a bit much to ask – blue skies and heat on holiday! It was quite cool and rather windy when I got to Lake Garda. Still, the Hotel Bellevue San Lorenzo is still amazing. And the food as good as last year (stuffed fillet of salmon trout was last night’s starter – and I was mighty impressed with the gruppa and red mullet main course in a clam sauce; but it was the walnut terrine with mango sauce right at the end that unexpectedly blew me away). Today started overcast. But the wind has blown much of the cloud away, and a choppy boat ride over to the market at Limone was very pleasant, as was the amaretto ice cream back at Malcesine. The church in Limone has two enormous paintings over the sides of the altar: an adoration of the magi, and a representation of the woman breaking the alabaster jar of ointment over Jesus’ feet. They are both, of course, pictures of extravagant worship – and therefore very fitting. The wise men travel far, across dangerous political boundaries and with no expectation of gain – their journey is all about giving alone. Their gifts are costly, though the fact of their journey is more costly still. And at its end they simply see a child and worship. Worship is its own end. Then, foreigners as they are, they turn back and find they must go home a different way, but their hearts have been left behind and home now is an elusive concept. The woman with the ointment is, of course, ridiculed by the male disciples. It’s a waste. It could have been sold - the money could have been given to the poor. But Jesus sees she has poured out her everything upon him – upon his feet, because she dared not look higher, she did not allow herself any greater sight of her Lord, she did not presume herself worthy of any greater honour than the role of a slave, cleaning his feet at a feast. The other men dismiss her; Jesus raises her up – she is no menial maid, but a human being who has done something beautiful, the equal of anyone, a worshipper in spirit and truth, whose life and actions will be sung through the ages as revelatory of the Gospel: we are all free to worship without fear; we are all free to draw near; we are all loved, forgiven, restored, seen and known from the heart outward - all are welcome here. Interestingly, above this altar are pictures of “outsiders” – three rich gentiles and one poor woman. Is it because they know they are outsiders that they worship so passionately? Is it because they know there is a wonder in the open arms of Jesus that tears flow so freely from their grateful hearts? This church in Limone is right to celebrate outsiders at the centre of its worship space, for the cross is a place where the dividing wall is broken down, the curtain between humanity and God is ripped in two, and where the prejudices we unthinkingly live by must carefully be dismantled. “Come in, come in,” cry these paintings, “all are welcome here”. How very Jesus. How very Gospel. Rooney is five for five. The form of his life. His goal today was the definition of a counter-attacking strike, beginning with an opposition free kick. And, for a team which is notorious at starting slowly - United fans are feeling quite good right about now. 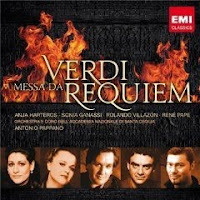 From HMV Oxford, a former employer of mine, I bought EMI's latest recording of the Verdi Requiem this week. The Archdeacon of Morgannwg & I agree it is one of the essential desert island discs. I confessed I was late to breakfast because I had been listening to it; he thought he ought to pass on that I, one of the few the resident evangelical at clergy school, couldn't make it up in the morning without listening to a Requiem first. Here's the Amazon page, which includes access to excerpts. I first sang this piece when I was 12. I love it as much now as then, and I have to say this version is right up there at the top of the pile - and I really do own a pile of them. We are allowed to be bigger than the boxes that limit us in our own and each others perceptions. Tomorrow I shall enjoy Richard Wood hoping he can send me texts as Spurs endeavour to score against United; tonight I let Verdi fill my front room with majesty and awe. Sunday I shall be at St Aldate's to hear Simon Ponsonby preach, and to worship in my old church once more as the band plays on loudly; Monday I shall sit by Lake Garda in peaceful Italian sunshine. And it turned out that Wycliffe wasn't just a place to park my car - as I left, I bumped into Peter Walker, just about the only tutor there now I know. We had a lovely chat. There are opinions and stories about Wycliffe these days, and honestly - I feel for everyone, but it's not my role to be the judge. Peter too started to speak about the situation, but I stopped him, told him it was alright, and that whatever was true or not true was really none of my business. What was my concern was that Wycliffe had given me wonderful tools to handle the Scriptures and to pass them on - the real gifts of being an evangelical in the Anglican church. Great practical academic gifts. Gifts that can challenge the system of evangelicalism when it needs challenging because it isn't being scriptural enough; and as long as the college was not abandonning that in favour of simply teaching the system, the "accepted evangelical way", ultimately I had no questions. If it was losing that edge, then I felt it a shame - because of the riches of what I have been given, and how I am daily able to pass that on to people here. And I do honestly pray that Wycliffe continues to pass on the gifts I was given; and I suppose I do honestly have doubts - but it is not for me or others like me to pass judgement. Perhaps to express concern; certainly to pray; never to judge. Matty's birthday coincides with the anniversary of my induction at St Catherine's. I was made priest-in-charge here on September 5th 2000 (vicar a year later). Matty was born on September 6th 2000. His birthday begins each new year here for me. His & my tenth. They've been there for, ooh, four years maybe. Three, certainly. Now we are well established with a pattern of worship where I hardly ever lead a Sunday service - members of the church do this. No-one leads more than one or two a month. And this term, as I looked down the list of preachers at the evening service, I realised that out of 19 evening services (including Christmas Eve), I am preaching only 10 times - barely the majority. I love preaching; but I love seeing the vision of gifts released and people growing in these gifts far more. In year two or three, I tried to encourage some of the folk here to preach - just to try it. It was the right idea at the wrong time. Now - now it flies! And this was a weekend for beginnings too. Trish Tazzini-Lloyd has finally begun as our new children's worker, taking over from Kirsty, and on her first Sunday clearly showed why the Lord has brought her to us. Naomi was the right person at the right time; Kirsty was the right person at the right time, a real gift following a real gift. And now the Lord is building on these gifts with something new for us - Trish led our Family Service with a new style and enthusiasm, and with her own self and life with Jesus that was just great for us. And when she preached in the evening (I was worried I was asking too much for the first weekend) she did so with such wonderful casual grace and impact that Stewart simply commented "What a find". Indeed - but more, what a gift. As I know we as a church are to her & her family, they are to us. Which is how it should be. And now I am in Oxford for the diocesan clergy school. All the fun of the fair. Literally - as the St Giles Fair, one of the great highlights of the Oxford year, and one which countless generations of undergraduates never experience as it falls now, weeks before University term commences, is in full swing just a stone's throw from St Anne's College where we are all staying. Most people came by coach. I, of course, drove my Saab. And parked across the road in my reserved spot - Oxford is notoriously difficult for parking. But, as I explained to the archbishop over supper, one of the many advantages of being an evangelical, is being able to park your car at Wycliffe Hall. His first question to me was about what we are doing with wine at communion, which may well have been a question on some of your minds... "Are you allowing people to take the chalice, whilst giving them a full range of options?" he asked. "Yes," I replied, "with everything fully explained in the notice sheet every week." "Good," he said, "that sounds perfectly right to me." (Internal sighs of relief from the vicar of Pontypridd.) "I think I'll use this opportunity to clarify to everyone that this is what they should do. Do you know," he continued, "I went to one parish where they were not only unsure about whether they should continue to have cups of tea after the service, but also whether they could have biscuits on a plate? In the end they decided to have Kit-Kats, as they were wrapped up. Ridiculous". Good old Anglican common sense prevails - indeed, I should add that we had a long email conversation where Barry made this clear; it is entirely possible I might have written slightly misleading sentiments elsewhere on this matter... I thanked the archbishop for putting up with me; he replied he was getting used to me by now. That seemed fair. After all, I have now lived in Pontypridd longer than I lived here in Oxford. Ponty is profoundly home, profoundly where I belong. And yet, driving into this city brings back so many memories, so much of my life, so many things the Lord has done for me - it still feels like home. The air has a particular smell here. Perhaps it is the river. Or the industry. Or the sandstone or the learning or the snobbery - or all of the above. But, as when I go back to Lancashire, the Lord granted me roots here, and I thank him for this gift too, and for the sense of 'home' coming here both brings and unsettles. I am reminded of those words in Hebrews 11: "They were longing for a better country-a heavenly one. Therefore God is not ashamed to be called their God, for he has prepared a city for them." Home here is but a pale reflection of the one to come; we are to cherish it, but not to be fooled by it. Or we become the Isrealites who wanted to be back in Egypt, when there was a Promised Land ahead of them. And the nature of this promised land? Goodness, let me be short term. This, as I started by referring to, is now year ten for Matty and I. What are the watchwords of the work I am called to do? A church that is a family for all. More leaders, preachers, gifts, space - and the work we have ready for and in the hall is a huge part of the fulfillment of this. My job is to worship God; his job is to grow the church. I have a list of things in the back of my Bible, here at the side of me. I am amazed at some of the things there, how they have happened over the years, and how some things now seem so prescient, so apt, when before they seemed just words. We are to be the church that can - in a place that fears it cannot. But with Jesus, we not only can, we will! Last week, Kate Scott-Williams from BBC Radio Wales came back to us & spent Wednesday afternoon recording a piece for "Good Morning Wales" about our PodCaths podcast! Click here for the BBC webpage about it, and you can listen to Kate's story on that page and hear what she found out. As well as meeting the group, and listening to us as we recorded our second podcast (now on iTunes - though as of today it's the only one there as we seem to have lost the first one, so don't get too confused!) she interviewed Stewart and Joyce, and then she & Gill Tuck took a recording to John Murphy in his home to get his reaction. He sounds lovely. So: if you've had a listen, let us know how you think it's going. We are enjoying doing it - when we record we are still a bit "well behaved", but I think soon we'll get the hang of it and then... Goodness only knows what will happen. And maybe Matt will even emerge from under the table. Aled Jones advertised PodCaths on his Radio 2 show this morning (Sunday Sep 6th); click here for the show (available for 7 days only I think), and go to nine minutes twelve seconds... but don't blink, he takes about ten seconds over it. Still, a plug is a plug! Diolch yn fawr, Aled. And the Bible Society included us in their weekly Newswatch (again, that might be a date limited link)!